No frowns allowed. Nope. None. 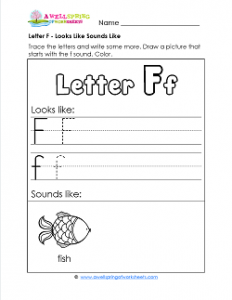 You just turn that frown upside down and get on with this fun and fantabulous letter f looks like sounds like worksheet. Put your pencil in hand and write and trace those letters. Do a good job now. Stay focused. No frittering around. Now let’s think of something that starts with f. Hmmm. How about fox, or farm. Then there’s fan or frame. Whatever you choose, draw a nice picture of it. Please color the page with your very best coloring skills.